News: Marc Newson, the industrial designer who joined Apple in September, is working with Italian gun brand Beretta to launch a new version of the 486 Parallelo hunting shotgun next month (original version pictured). Marc Newson has designed a version of the double-barrelled 486 Parallelo shotgun for Italian firearms manufacturer Beretta, a company established in 1526. Newson's design will be released on 13 November, when the gun is officially unveiled at an event in London. 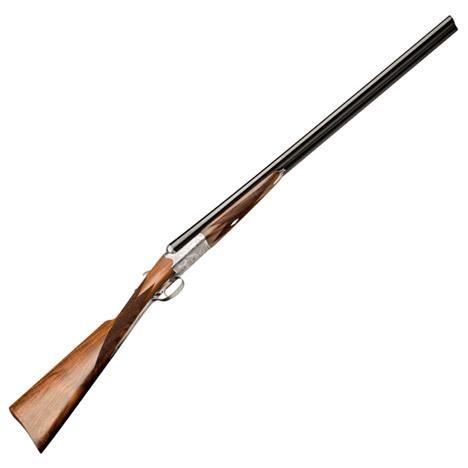 It will be a version of the existing 486 Parallelo (picture above) – a 12-gauge side-by-side game gun that features a round body receiver and lavish engravings. Beretta currently produces 1,500 weapons a day, with "sporting firearms" counting for an estimated 90 per cent of production. Its repertoire includes shotguns, pistols and rifles. American Armed Forces and State Police Forces started using the Beretta 92 pistol series in 1985. Firearms have proved increasingly controversial in the design world since the first 3D-printed gun was fired last year. In May, Paola Antonelli, senior curator of design at New York's MoMA, said the notion of design as a force for good had been upturned by the 3D-printed weapon, which London's V&A museum acquired just months after its release. Tech giant Apple announced that Newson had joined its design team in September. Since then the Australian designer has launched a draught beer machine for Heineken, adding to his diverse portfolio of projects – see a round-up of his work.